Despite the ample opportunities we took to taste beautiful, local Portuguese wines and ports, much time still remained to explore the lovely city of Porto and take in the culture of “the North.” Porto is an extremely hilly city, and in certain areas its tightly packed buildings appear to be stacked on top of one another, shouldering each other out of the way and jostling for position along narrow, steep streets. 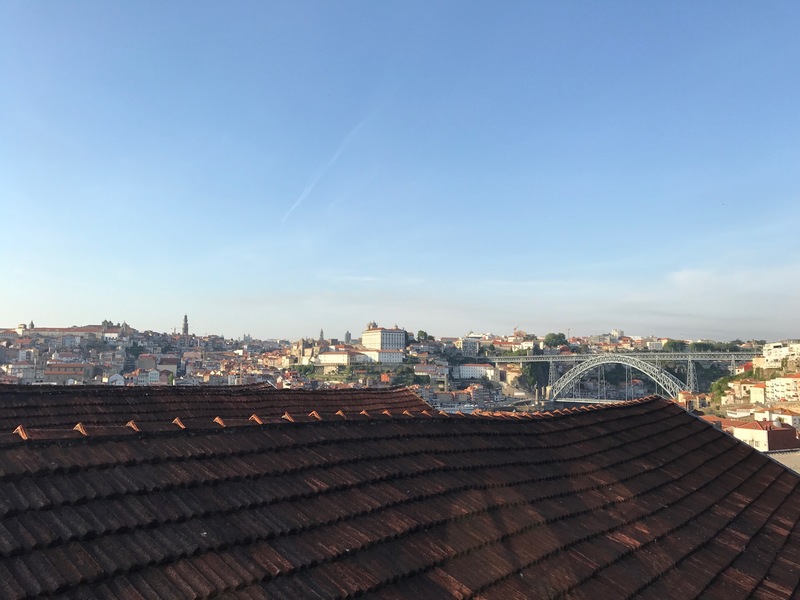 Mere minutes from our Airbnb we found the Cathedral of San Francisco, ensconced across the street from the languid and greenish-brown Douro River which flows through the city. 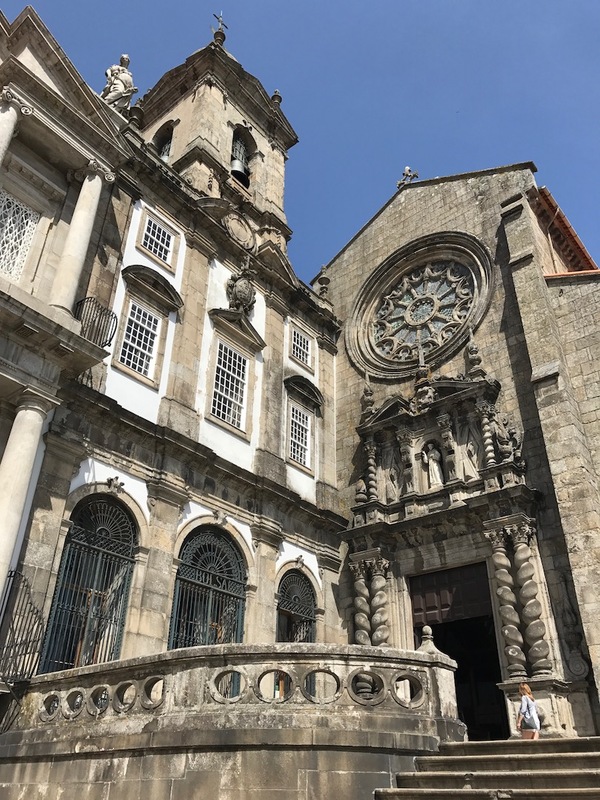 The imposing gothic and baroque church (the mingling of styles is common in Porto) sat atop several large, stone-walled terraces which towered over visitors as they climbed up to the central, stone-paved courtyard. 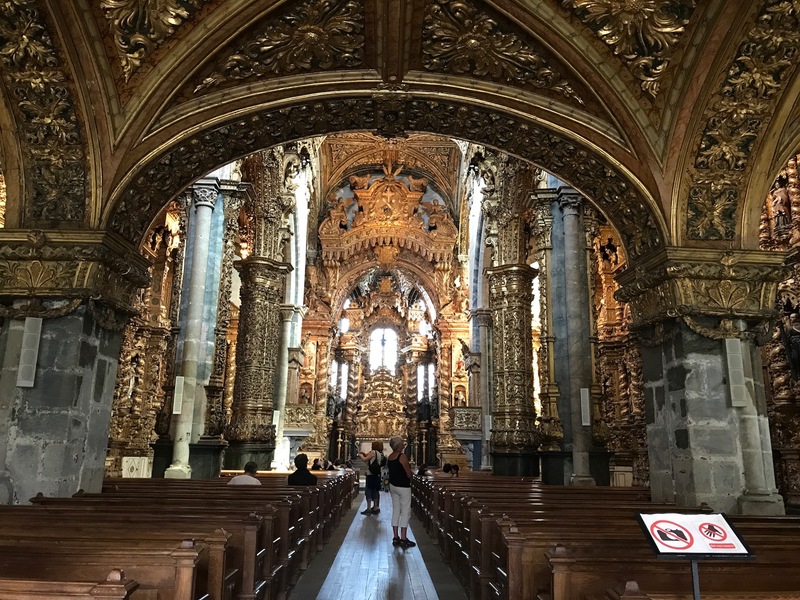 Inside the cathedral, some of the deepest, most ornate, and tangled wooden carvings I’ve ever seen, many of them gilded, encrusted virtually every surface, and fanciful vegetal motifs closed in around us and created a dark, shining and heavy canopy above our heads. Beneath the cathedral and museum lay an eerily lit catacomb system, full of tombs both stacked above the floor and concealed beneath our feet (the latter marked simply with numbers carved into the slate and wood floor slabs), which went out of use in the 18th century in favor of open-air burial. Sanitation and all that jazz. 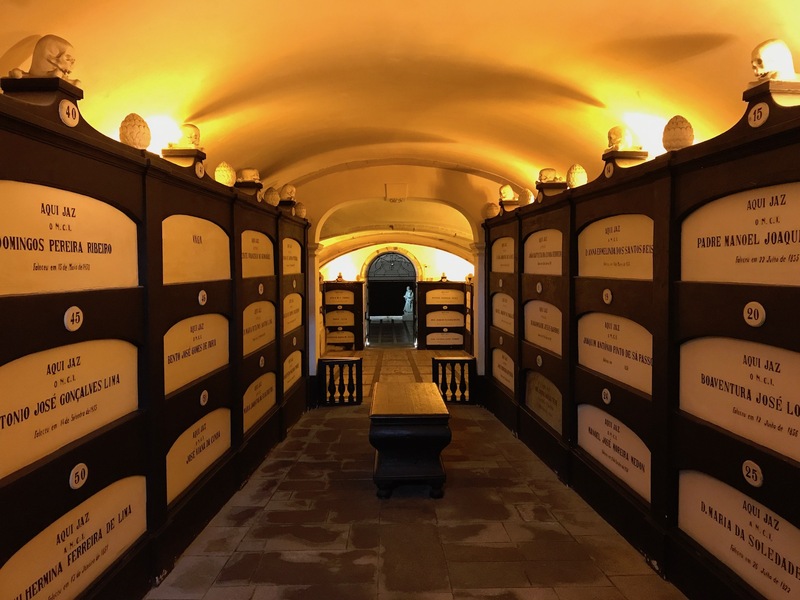 Although lacking in multitudes of stacked skulls, this cave-like burial ground still sent shivers up our spines. Our Airbnb host also recommended that we climb Clérigos Tower, located on the university grounds up on a hill (of course) – or rather, she suggested that we indulge in a culinary specialty of Porto called the Francesinha – a layered sandwich containing four types of meat (sausage, fresh sausage, steak, mortadella), cheese, a slice of french toast, and topped with more cheese (melted), a tangy red sauce (lots) and an over-easy egg (usually) – before climbing said tower. And then hike it to burn off our lunch (note: residents of Porto use the sandwich to fill their bellies before a big night of drinking). Given our activities of the previous afternoon/evening (tasting more wine than a sommelier engaging in daily blind-tasting practice), however, we ended up climbing the tower first (after consuming a half-loaf of crusty bread and large chunk of soft, tangy, life-giving cheese while standing in a local market and balancing our goods on a small shelf, then sucking down two large glasses of fresh-pressed juice at a cozy smoothie bar, tasting a few beers [Joe did most of the tasting, I ate most of the peanuts] at one of Porto’s small breweries, and then wandering up to the tower and chugging a bottle of water in preparation for the climb). We then rewarded our efforts (225 steps!) 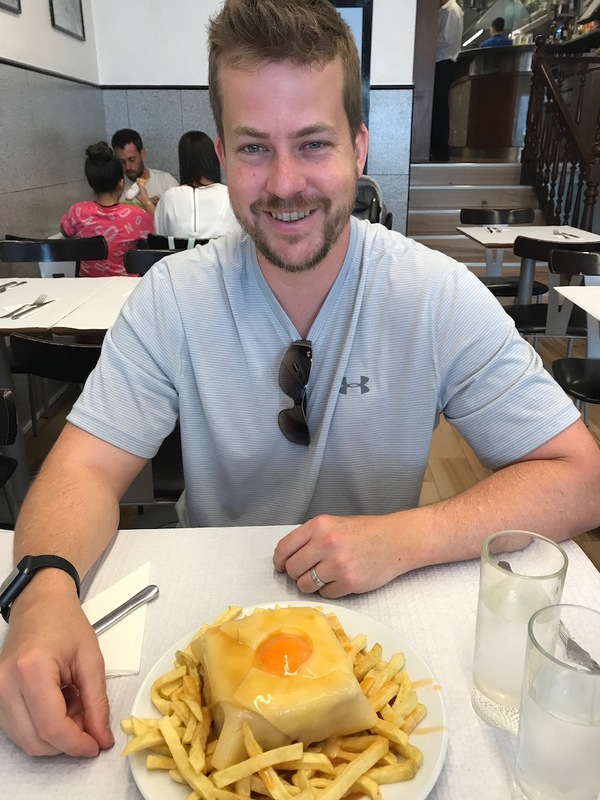 by splitting a plate full of the ooey, gooey, meaty goodness in a nondescript, white-tiled and plain-walled cafe that won “best Francesinha” many years out of the last ten. 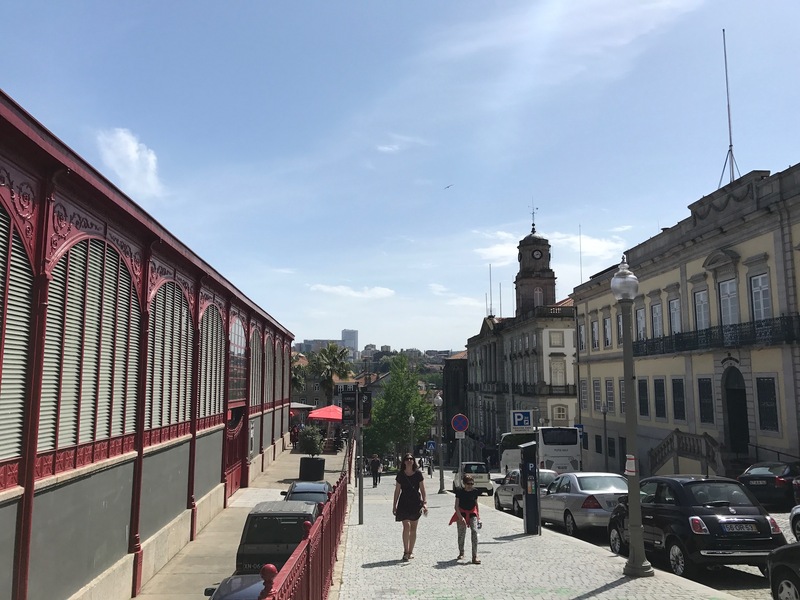 We learned that consuming a Francesinha is an epic, artery-clogging, but in our case reviving experience that can not be missed while visiting Porto (the sandwich’s birthplace). 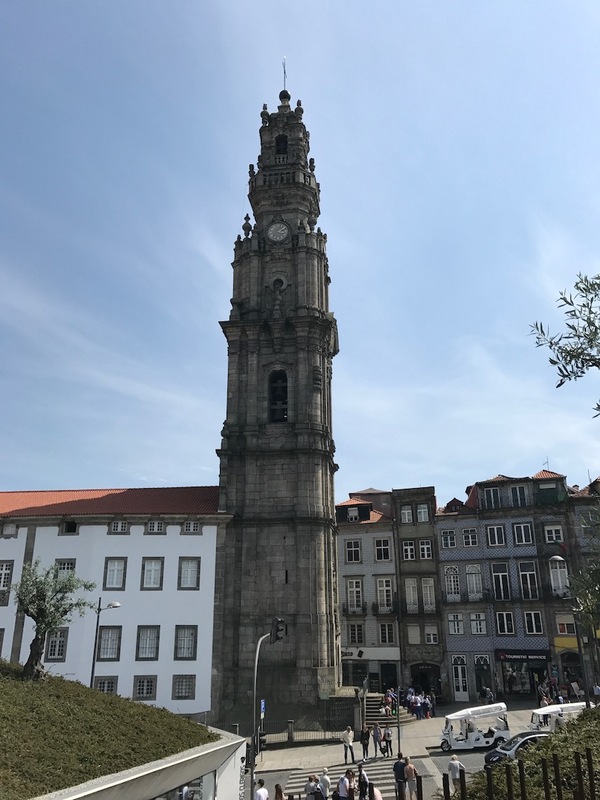 Clérigos Tower, attached to a church, was indeed pretty cool and deserves more than a mere mention sandwiched between descriptions of Porto’s most famous dish. The church is oblong (rare in Portuguese religious architectural design) and the tower, finished in 1763 after 9 years of construction, rises 75m above the surrounding plaza (about 245 feet). After waiting about 30 minutes in line to ascend the tower (popular spot! 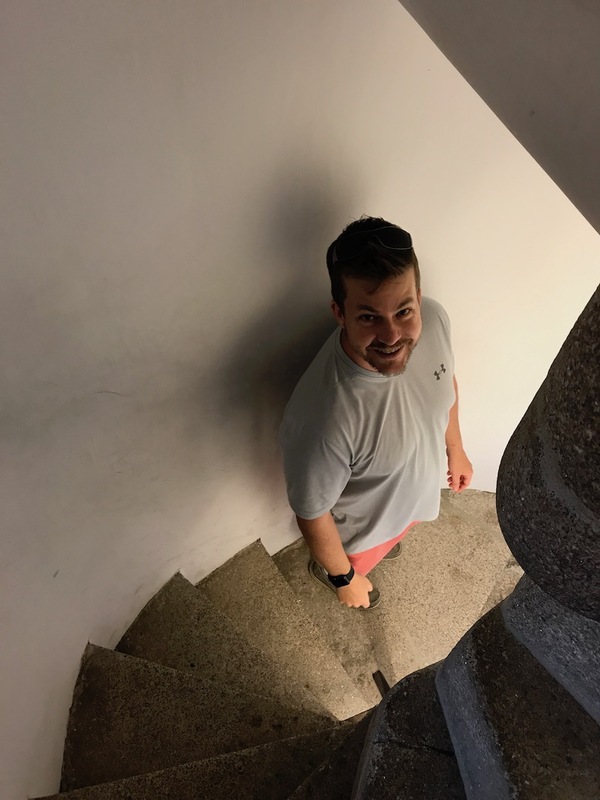 ), we joined a group of about 20 others and wound our way up the claustrophobic, steep stone staircase that circled the tower’s spine (not pictured here – that was just inside the church, but cuter pic!) and gave us access to the viewing decks. We found 360 degrees of expansive views, a brisk breeze, and a whole new perspective of the hilly city – it reminded me of climbing Sather Tower, more popularly called the Campanile, on Cal’s campus and gazing out over Berkeley and the San Francisco Bay (as a point of interest, the observation deck on the Campanile is at 307 feet – but that tower was built about 240 years after Clérigos Tower!). 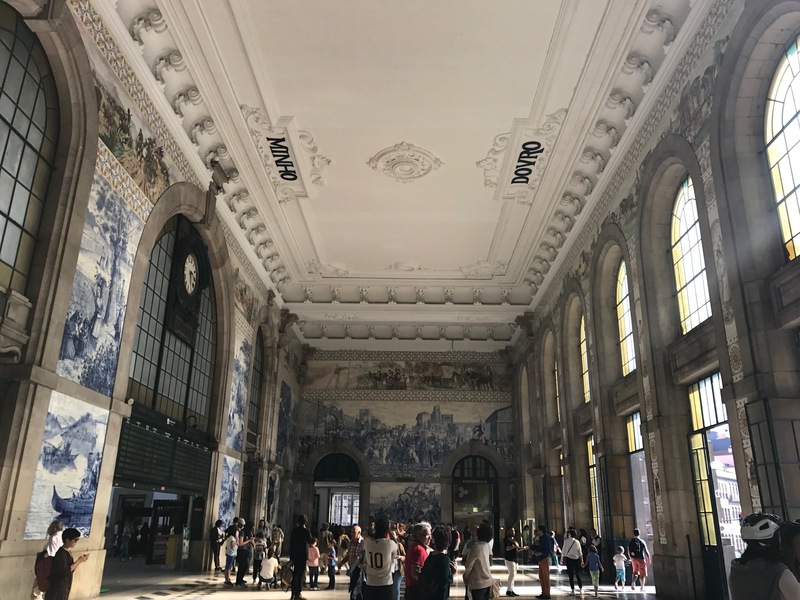 Some other architectural highlights: Porto’s gloriously tiled, vaulted-ceilinged train station, a red and grey “hard club” (that features metal concerts) across from a park and the San Francisco cathedral, the long, narrow structures employed by the port companies for aging and processing their wine, and so many more. Such a dynamic, old, and grand city!